Configuration: 12 boxes per case. Back by popular demand, Topps is proud to reintroduce Star Wars: Galaxy! Featuring brand-new artwork, along with art from the Lucasfilm vault, and autograph signers from across the Star Wars Saga! 2 hits per hobby box, with 1 autograph guaranteed! BASE CARDS 2018 Topps Star Wars: Galaxy will include 150 base cards in new pieces of illustrated artwork showcasing characters and events from throughout the Star Wars galaxy and saga. The second half of the base cards will consist of images never before seen on trading cards, including concept art, illustrated collections, modern comic book art and covers, illustrated movie and event posters, and more. Blue Parallel - Green Parallel: 1:4 packs. Purple Parallel: sequentially #d to 99. Orange Parallel: sequentially #d to 25. INSERT CARDS Journey of Ahsoka Return of the highly collectible Star Wars Card Trader set featuring art for Star Wars: Rebels created by director Dave Filoni. Wanted Posters The 6 Star Wars: Rebels Season 4 Wanted posters illustrated by Eli Maffei. Galaxy Puzzle Featuring a 6-panel character puzzle that links up with all of the previous sets by artist Joe Coroney. Star Wars: Rogue One Propaganda All-new propaganda style posters for The Empire and The Rebellion from Star Wars: Rogue One by Star Wars artist Russell Walks. New Trilogy Propaganda All-new propaganda style posters for The First Order and The Resistance by Star Wars artist Russell Walks. Star Wars: The Last Jedi Character Insert Featuring all-new artwork from the Glebe Brothers. AUTOGRAPH CARDS Autographs Featuring signers from across the entire Star Wars saga. Blue Parallel: sequentially #d to 50. Green Parallel: sequentially #d to 25. Purple Parallel: sequentially #d to 10. Orange Parallel: sequentially #d to 5. Dual Autographs - Orange Parallel: sequentially #d to 5. Triple Autographs Red Parallel: #d 1/1. 6-Person Autograph Sequentially #d to 2. Featuring autographs from fan favorites including: Harrison Ford, Carrie Fisher, Daisy Ridley, Adam Driver, John Boyega, Hayden Christensen, Felicity Jones, Forest Whitaker, Billy Dee Williams, Ray Park, and many more! SKETCH CARDS AND PATCHES Standard Sketch Cards Shaped Sketch Cards Panoramic Sketch Cards Commemorative Patch Cards Featuring classic Star Wars: Galaxy artwork reproduced as patches. Blue Parallel: sequentially #d to 199. Green Parallel: sequentially #d to 150. 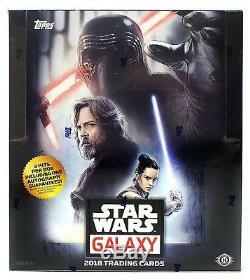 The item "2018 Topps Star Wars Galaxy hobby factory sealed 12-box case in stock" is in sale since Monday, December 17, 2018. This item is in the category "Collectibles\Non-Sport Trading Cards\Star Wars Trading Cards\Trading Card Singles".